How to Design LED Flashing Wristbands Online? Fantastic news! Amazing Wristbands bring you the newest must-have product – gorgeous glowing and flashing LED Wristbands! 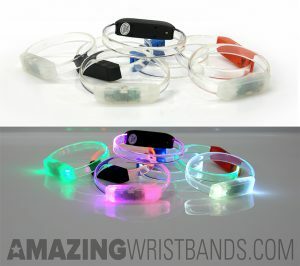 Add a message or logo to our amazing LED bracelets and see the special design light up and glow! The message is laser etched onto the inside of the band and when illuminated by the LEDs, the bands will glow and the message will shine brighter and more brilliant than the rest of the band. Informally known as World Nonviolence Day, International Day of Nonviolence falls every year on October 2. Officials chose the date in June 2007 to commemorate Mahatma Gandhi’s birthday because he was a pioneer in the nonviolence movement. On the day, around the globe, numerous communities participate in education sessions, awareness events, and promoting nonviolence. Best way to show your support is with personalized silicone bracelets! 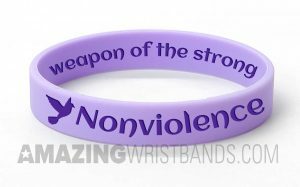 Educate yourself about the importance of nonviolence—check out online sites such as nonviolence.com or the Alternatives to Violence Project. Talk to your community leaders about hosting an educational event or street awareness campaign. Not just on International Day of Nonviolence but every day through the year, set the example of peace, tolerance, and understanding. And you can spread awareness throughout the year by wearing the message—you can have T-shirts or wristbands customized for this purpose. You can use wristbands, for example, as an inexpensive and colorful way to get people to notice your point. You can imprint different messages on them, such as “Give peace a chance” or “Nonviolence is a weapon of the strong” or simply as "Nonviolence" with an artwork 'Pigeon' - a symbol of peace. And you can get them with eye-catching effects such as glitter or glow-in-the-dark elements. Amazing Wristbands is a leading provider of customized silicone wristbands online. Our bracelets are comfortable, durable, and non-allergenic, made of 100% silicone. You can create them with our easy-to-use online tool. In addition to standard offerings, we also offer super popular snap slap bands that “snap” to a person’s wrist, as well as half-inch bands, thicker one-inch bands, adjustable bands, USB bands, silicone rings, and silicone key chains. Artwork and design for FREE. AmazingWristbands.com is a leading provider of 100% silicone wristbands online. We produce quality products backed by unbeatable customer service, fast delivery time, and competitive prices. The 2016 Summer Olympics is formally named as the Games of the XXXI Olympiad. But it is popularly called Rio 2016. This is a major international multi-sport event and is held from August 5 to 21, 2016, in Rio de Janeiro, Brazil. 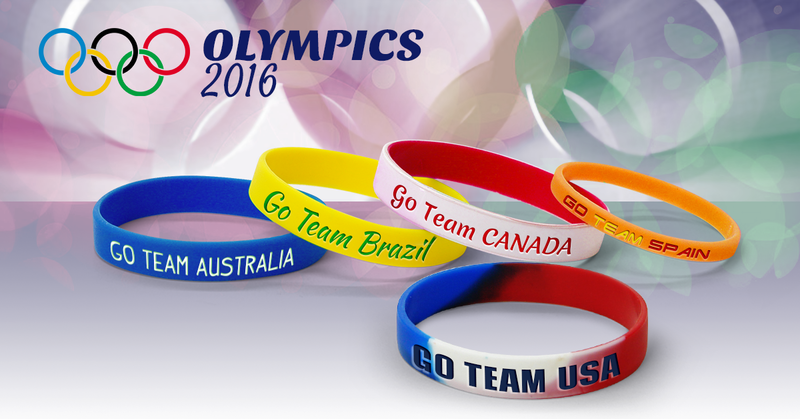 Show your love for the 2016 Rio Olympics with our custom-made silicone bracelets. Many people from young to old enjoy sports. The Olympics features 28 sports, including high jump, swimming, archery, weight lifting, and more. Almost all of the countries from around the globe are competing, including the U.S.A., Canada, India, Italy, and Brazil. Support your favorite team with our bracelets, which are made of 100% silicone and are great everyday accessories. There are numerous different styles and colors to help spice up the look of the wristband. In fact, creativity is the biggest part when it comes to designing your bands. You can get even more creative with your band by having it printed with your personalized message. Many different colors, text options, and designs that shine! Images that incorporate your favorite sport or team. A variety of sizes to suit your wants and needs. Amazing Wristbands is a leading provider of customized silicone bracelets available online, including bracelets customized with your message. Our bracelets are comfortable, durable, and non-allergenic. Most important, our bracelets are your bracelets. Our professional and friendly customer service agents will help you build your customized, fun wristbands for the 2016 Rio Olympics. We offer a wide variety of band types and colors to help your bracelets stand out and make a difference. In addition to standard wristbands, AmazingWristbands.com also offers slap bands, adjustable bands, USB bands, silicone rings, and silicone key chains. Experience the difference here! NO MOLD FEE on any quantity of bracelets. FREE artwork for your bracelets. Get a detailed wristbands quote for your customized Olympics bracelets in minutes and order by visiting us at AmazingWristbands.com or give us a call at 1-800-269-0910. When you're happy, we are happy. When you get the product you want at the price you need, we are all amazingly happy.